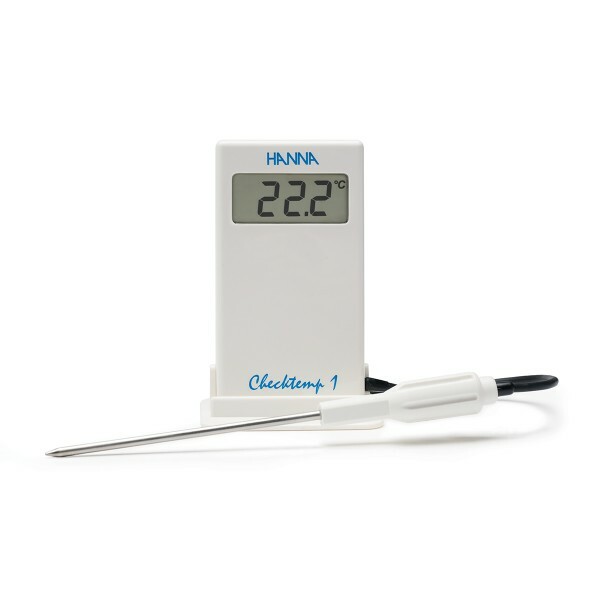 Product information "HI98509 Checktemp® 1 Digital Thermometer"
The Checktemp® 1 Digital Thermometer - HI98509 is a high-accuracy thermometer with a 1 m (3.3’) flexible, silicone cable connecting the meter and the stainless steel probe. The sharp-tip penetration probe easily lances semi-solid products such as fruits, vegetables, and cheeses. This probe can also handle liquid, air and measurements in frozen materials. The probe incorporates an NTC thermistor sensor to measure the temperature. HI 98509 (Checktemp®1) is supplied with penetration probe, 3.3’ silicone cable, batteries and instructions. Related links to "HI98509 Checktemp® 1 Digital Thermometer"
Customer evaluation for "HI98509 Checktemp® 1 Digital Thermometer"
HI740024P Base for Checktemp® 1, 10 pcs.